The initial consultation requires a referral. Referrals from a General Practitioner are valid for twelve months, and for three months from a Specialist. An extended period of time is allocated for the initial consultation and therefore a higher fee is charged. You may need to return for further consultations following the initial consultation. This may be required for test results, investigations and ongoing monitoring of your condition. A lower fee is charged for these consultations as less time is usually allocated. The early post-operative care consultation is included in the fee for surgery (this includes the in-hospital care). At times further care is required in hospital which may require billing. BrizBrain & Spine choose to use the Australian Medical Association as a guideline for billing purposes. For additional information regarding patient fees please contact our office and one of our team members will be able to assist in your enquiry. On completion of the consultation, you will be issued with an invoice and required to pay at the time of the visit. You may pay by cash, cheque, EFTPOS or credit card (MasterCard or Visa). Once this is finalised, our receptionist will submit the claim to Medicare for processing of your rebate. If you have submitted a WorkCover Claim or Third Party Claim, you will need to bring your Claim Number, contact details of the assigned Case Manager, and current WorkCover Certificate to the consultation. The account will be the responsibility of the patient and will require payment at the time of consultation. If the account is to be paid by another person, business or employer, written authorisation is to be provided at the time of consultation and will be required to be pre-paid prior to the consultation. BrizBrain & Spine aims to ensure our patients are informed of the associated surgical medical expenses. We encourage our patients to discuss these costs with a team member at BrizBrain & Spine before your procedure date to be sure you understand what you will be liable to pay. The estimate of fees will be provided to you prior to your elective surgery. Sometimes in an emergency and out of normal business hours it is not always possible to give an estimate of fees prior to surgery. This can be provided the next business day. Unless specified, the estimate refers only to the fees charged by this practice (including surgical assist fees and Neurosurgical Nurse Practitioner fee). It does NOT cover services provided by other doctors, including anaesthetists, radiologists, nuclear physicians and pathologists, nor other costs associated with your stay in the hospital (e.g. accommodation, pharmacy, and physiotherapy). Please be aware that this is an estimate only and the actual costs may differ from the estimate due to unforeseen circumstances that may arise during the procedure. In this instance it may be necessary to arrange additional medical services which you will be held liable to pay. BrizBrain & Spine will coordinate and arrange all of your admission details. Once your admission has been arranged you will be notified in writing of your admission details. Prior to your admission to hospital you will be contacted to verbally confirm all of your admission details. If you require any information or additional assistance throughout this time please do not hesitate to contact our office and ask to speak directly to your treating Doctor’s assistant. 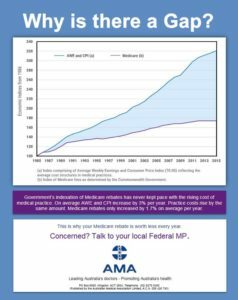 The Australian Medical Association (AMA) also publishes recommended fees for medical services and BrizBrain & Spine use these fees as a guide. The Medical Gap is increasing as the Medicare rebate is not keeping pace with inflation. 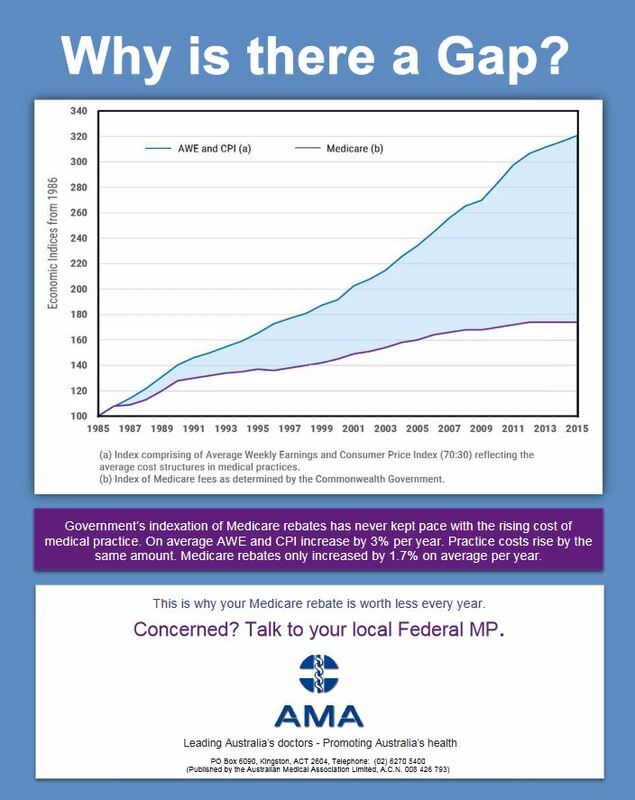 The Federal Government are not adequately increasing the Medicare Rebate. The Medicare Schedule was established in 1985 but has not increased in line with inflation. The costs of running a quality medical practice have increased phenomenally with computer software, hardware, information technology, insurance, staffing and Medical Indemnity. The graph above shows the change in general price levels compared to the Medicare rebate since 1985.